The Gleneagles Hotel is a place where great things happen – Gleneagles was proud to host the G8 Summit of world leaders in July 2005, and it will be the venue for the 40th Ryder Cup Matches in 2014. 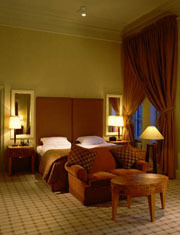 The hotel has 232 spacious guest bedrooms, including a variety of luxury suites to suit all needs, tastes and desires. Guests staying at the hotel can take advantage of the wide range of experiences around the resort. There is plenty to do, with a selection of shops to browse and free access to the leisure club, swimming pools and tennis courts. Children can be entertained in The Playroom and older children have their own space, The Zone. a founder member of Connoisseurs Scotland, the group of properties which provide an authentic flavour of Scotland to discerning travellers.